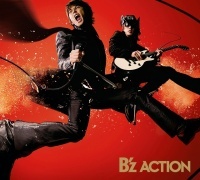 ACTION is the sixteenth studio album by B'z, released on December 5, 2007. The release of the album was immediately preceded by the induction of B'z to Hollywood's RockWalk of fame. They became the first Asians to be inducted and joined the likes of AC/DC, KISS, the Rolling Stones, and Van Halen. Two singles—the emotional ballad "Eien no Tsubasa" written for the film For Those We Love and hard rock single "SUPER LOVE SONG"—were released in the months leading up to the album. 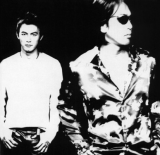 The album's production was more troubled than any other in B'z history to that time. Recording began in January and was not completed until late in the fall. Initial difficulties arose due to Tak's desire to explore new territory as a result of the album being representative of their twentieth anniversary year. After battling several unproductive sessions, the band were left with one of their most eclectic albums to date that fuses jazz, pop, and shuffle rhythms for the first time in their history. Despite its length of seventeen tracks, all but three of the songs have been performed live. The resulting album tour B'z LIVE-GYM 2008 "ACTION" would also prove one of their longest, lasting from January to August of 2008 and leading into their twentieth anniversary tour B'z LIVE-GYM Pleasure 2008 -GLORY DAYS-. After a half-decade of dormancy, several songs from the album were played during B'z Special LIVE at EX THEATER ROPPONGI in 2013. The show was a one-off performance tied to purchases of B'z The Best XXV 1988-1998 and B'z The Best XXV 1999-2012. Upon release, ACTION debuted at the top of the Weekly Oricon Albums chart with 292,987 physical copies sold. It would be ranked fifth for the month, number 36 for the year of 2007, and continued to sell well into 2008 where it ranked number 76 for the year. It has been certified Platinum by the Recording Industry Association of Japan and is nearing Double Platinum status with sales of 440,108 last reported. In 2018, the album was reissued as a two vinyl set made available to visitors of their thirtieth anniversary public exhibition entitled "SCENES" alongside all other studio albums to that point. The first sighting of B'z activity for the year of 2007 was the announcement of their first international tie-in. The PlayStation 2 racing video game Burnout Dominator was released worldwide in March and featured an all-new B'z song in every territory entitled "FRICTION". The song was included as a means of promoting the game primarily in Japan, but it would later be included the next year in the sequel game Burnout Paradise that was likewise released globally. The song was also published worldwide on iTunes at the same time as part of the soundtrack. This version of the song would be re-recorded with new vocals and an altered arrangement for the year's studio album under the title "FRICTION -LAP 2-". Beginning in June, B'z embarked on SHOWCASE 2007 -19- in which the band ran the gamut of Zepp venues in Sapporo, Sendai, Tokyo, Fukuoka, Osaka, and Nagoya. As is now common for the events, B'z played a number of gems and obscure songs for the tour, including "HOT FASHION -Ryuukoukata-" for the first time in 14 years, "ARIGATO" for the first time not on TV, "The Wild Wind", "Naite Naite Nakiyandara", and "Haru", as well as "Out Of Control" and "Odekake Shimasho" for the first time since the mid-1990s. The show at Zepp Tokyo would be released on DVD in 2008 and on Blu-ray in 2009. The concept was broadened and expanded into yet another of its kind, the aptly-named B'z SHOWCASE 2007 -B'z In Your Town- which toured smaller areas of Japan throughout July and August. Further fan favorites were added on varying dates including "The Loose", 2001 B-side "ROCK MAN", the return of 1998 single "HOME", the live debut of "BANZAI" B-side "Magnolia", and even GREEN album ender "GO★FIGHT★WIN". None of the shows were released in full, though select moments were highlighted on the 2008 "Official Bootleg". Although their second-longest album in terms of total songs included, ACTION was an album that did not come easily. Koshi described its production as being the result of a struggle and slump unlike anything that had preceded it. With their twentieth anniversary looming and a tour to support this album already planned, there was immense pressure to complete the album on time. This slump was partially the result of B'z deliberately leaving their comfort zone to find the limits of their capabilities as a band. Their motivation behind trying so many different flavors for the sessions stemmed from this being a lead-in to their twentieth anniversary year. There was an expectation within the band to push their boundaries, which led to more complex compositions and ones that relied less on guitar than previous works. Songs that evoke Latin, jazz, and shuffle rhythms as well as the golden era of 1950s American pop music. Combining the history of those many genres produced some of the album's most memorable works and laid the foundation for experimental tracks that would follow on proceeding works. While the album includes seventeen tracks, a total of twenty-three songs were produced during the production period. Songwriting began in September 2006 with the band entering the studio in January 2007 in Los Angeles. Surprisingly, even after a month of effort, not a single song was completed in that entire first month. "It was the first time that songwriting had not gone well," Tak said, adding, "it was a terrible shock." It was here that the band welcomed studio specialist Hideyuki Terachi to aid with arrangement, who has since served that role for many of their B'z and solo activities. Tak recounted that he started to dread going into the studio because the initial sessions were not at all amounting to what they expected. To overcome the slump, Koshi noted in the interview that they "started doing music with a different feel to it, and that went well" which led to them returning to their usual "recording rhythm". As a result, the album contains a large number of upbeat tracks that deal with a great variance of themes and topics such as the lively "HOMETOWN BOYS' MARCH" and the sentimental "Boku ni wa Kimi ga Iru". The album ended with the Ending SE from the previous year's LIVE-GYM, "BUDDY", which had its lyrics significantly overhauled. Along the way, some form of the word "light" was considered a candidate for the album's title. The slump that had delayed the album's completion resulted in the song "Koubou" (Ray of Light) as the prevailing attitude in the studio was one of seeking light. Instead, the overall theme was not just "light" but "taking action while seeking light". “ When we released the album [called ACTION] in November last year, if I think about it, it sounds like a long time ago. It's so long ago, that a couple of seasons have passed. By releasing the album, we gained some new experience; during its production, we encountered a lot of obstacles along the way. In that moment, we thought we just had to make some kind of "ACTION" happen or we'd never make progress. That's what we kept in mind all that time. Of course, it's all right to make some ACTION happen... But when you take ACTION, it's bound to the expectation that everything will go the way you have imagined. That's a completely different problem and it's difficult to solve. Of course, some will say, "That went well." But, there will also be those who say, "Not a lot has changed." Or even some who will of course say, "Now it's worse than before." So ACTION for what purpose, you ask? For example, when you find yourself in a very difficult situation but you're still trying to make the best of it; when you become desperate and someone else sees you in that state; when someone's extremely despondent and pathetic, there are those who will make fun of that person. But, what if there's someone who looks at that person and is moved by their will to live on that then surrounds them like a shining aura? There's that possibility, right? Of course, there might be times when not even one person bothers to look. In that moment, you should just imagine yourself tomorrow, or yourself next week, or yourself next year, or yourself in 10 years. There should be people who make ACTION happen the same way you do, right? We, as a band, have hit a lot of walls during our career. And during those times... We wanted to show our desperate side and take ACTION in order to progress little by little. That's the band we want to be. Having just "rebooted" the LIVE-GYM the year prior with B'z LIVE-GYM 2006 "MONSTER'S GARAGE", the band continued ahead by adding returning support member Barry Sparks for LIVE-GYM 2008 "ACTION". The tour became one of their longest, lasting from January to August of 2008 with the band then heading into Pleasure 2008 -GLORY DAYS- for their twentieth anniversary at Nissan Stadium. Not only were album songs performed, but also a great deal of hidden gems such as "Kimi no Naka de Odoritai", "LADY-GO-ROUND", "FRIDAY MIDNIGHT BLUE", and "FOREVER MINE". All music and guitar by Tak Matsumoto. All lyrics and lead vocals by Koshi Inaba. Originally a candidate for a single, "Junjou ACTION" was the direct result to the warm reception "SUPER LOVE SONG" received during its live performances over the summer. The title became "Junjou ACTION" but it was also considered for the simpler title of "ACTION". The genesis for the song came with Tak wanting to make a song with such a beat, but it stalled in production during their sessions in Japan. No progress was made for some time until Tak visited Koshi at home to discuss the difficulties that had been inherent in the album, and from that, they were able to immediately return to the studio and complete the song. Utilizing jazz scales for the intro and interlude, "Kuroi Seishun" combines the history of a dark youth with a bluesy jazz overture and also utilizes a wood bass. Tak said having Shane Gaalaas start the song with a cymbal roll and going into a 4-beat structure was "really cool". To get the jazz sound right for the song, Tak bought a jazz scale book for practice. After five years going unperformed, the song returned to open B'z Special LIVE at EX THEATER ROPPONGI. The lyrics from a juvenile perspective were described as Koshi as his favorite type of song to write, given he can imagine scenes and implement themes that are not common to adult-oriented lyrics. Although the song as we know it is a hard rock number, "SUPER LOVE SONG" began production in Los Angeles in January with it originally intended to be of a much slower tempo. The early days of recording what would become ACTION were rough for the band, with Tak expressing in a "CLOSE UP" interview: "We had a slump unlike anything before." Koshi noted that, to overcome the initial slump for the album's session, they started "doing music with a different feel to it. With that, we started to get the rhythm—what we call the 'recording rhythm'." The band were satisfied with the result and premiered it live in the summer of the same year. The song was collected on B'z The Best "ULTRA Pleasure" in 2008 and B'z The Best XXV 1999-2012 in 2013. For the purposes of this album, the song was initially considered as its opener. Originally intended to be recorded in the album's first month of production in Los Angeles, "Mangetsu yo Terase" did not take a tangible form until much later. The lyrics are centered around exposing pity and is inherently a song about emotion in general, and was inspired by the image of "waking up unable to see anything, until the light of the moon illuminates things around you that you wouldn't normally see at night." The song was performed on just under half of the B'z LIVE-GYM 2008 "ACTION" tour and made it onto the home video. A hard rock song with an encouraging theme, "Perfect Life" is one of several B'z songs to feature mathematical references in its lyrics due to Koshi's background in the field. The English "Go on" portion of the lyrics was prepared as part of the provisional demo but was retained because it is both easy to understand for Japanese and fit the surrounding lyrics. Notably, the dedicated, full-length music video for the song was shot on location at the Kinoshita Circus. The song was revived five years after the album tour for several occasions in their 25th year, including the hall portion of B'z LIVE-GYM Pleasure 2013 -ENDLESS SUMMER-. Composed as a blend of hard rock and a power ballad, "Isshinfuran" was Tak's favorite track on the album at the time of release. As was the case with the album's latter single "SUPER LOVE SONG", the song underwent a great deal of change during production. This included changing keys, adding a number of small parts to bridge larger sections, differing tempos, and overall resulting in a different flavor than they initially expected. The lyrics use Tak's school days as a motif. The song has not been performed since B'z LIVE-GYM 2008 "ACTION". A song with entirely English lyrics, "FRICTION" was written for the Electronic Arts video game Burnout Dominator. The song was recorded in Tokyo with the band's mainstay Canadian drummer Shane Gaalaas being credited with advising the English lyrics. This new version subtitled "-LAP 2-" is essentially a re-recording with all new vocals, a new guitar intro and solo, and an all-new arrangement. Tak said he wanted to re-record the full guitar but it was too troublesome given the rest of the production. The original version is only available now as a B-side to "SUPER LOVE SONG" but was once available on iTunes internationally. The song has been performed more than most of their English output. After receiving its live debut during B'z SHOWCASE 2007 -19-, it would be performed several times and was also included in two international events in the United States and Canada: B'z LIVE-GYM 2011 -long time no see- and charity show Music for Relief's Secret Show for Japan later in the same year. One of the more experimental songs on the release, "ONE ON ONE" has lyrics that utilize sports terminology and imagery juxtaposed onto descriptions of everyday relationships. Terms commonly associated with sports such as "whistle" and "game" are both included in other contexts. The title, too, is sports-related, specifically referencing pick-up basketball games being held "one on one". Koshi instead relates this to difficult one on one conversations from which one doesn't feel there's an easy escape. Originally, the piano intro to the song was meant to be performed by strings but this was changed once the rest of the song was completed. It saw its first performance since the album tour with a premium one-off concert titled B'z Special LIVE at EX THEATER ROPPONGI in 2013. As a ballad that relies on piano and strings, "Boku ni wa Kimi ga Iru" was not deemed suitable for a live performance and thus was not included for B'z LIVE-GYM 2008 "ACTION". To date, it still has not been performed live. The song is one of very few in the B'z catalogue without a major guitar presence; throughout the song, there is only a brief electric guitar solo and chords being accentuated with an acoustic guitar. In order to make a "royal road"-style B'z ballad, Tak said, "I thought I wouldn't be required to use guitar." The lyrical theme was a sentimental one, with Koshi stating the song, "represented that if an important person were to be lost, even if there were trouble, the inspiration they left behind would remain." Featuring lyrics that relate to the working poor, "Nanto Iu Shiawase" speaks of those in less fortunate circumstances relying on love and family to push forward in life. Koshi said in an interview at the time that he wanted to explore such scenarios by adding, "The more I sing, the more songs rooted in happiness I can leave behind." Originally, the band intended to create a song akin to those popular in America in the 1950s, with Tak stating he felt his generation had become cool in a vintage sense now. The song has never been performed live. Opened by a Wurlitzer electric piano performed by Akira Onozuka, "Warui Yume" was the first song to at last be completed for the album after numerous issues with other tracks. "Peace" became the theme of the lyrics which were preceded in a guitar intro performed with finger-picking, which had not yet been utilized in B'z songs to that point. The overall arrangement has numerous jazz-like sections, giving it a sound unique in the B'z catalogue for multiple reasons. The song has not been played live since the album tour in 2008. Born out of Tak's desire to attempt shuffle rhythms on the album, "HOMETOWN BOYS' MARCH" was considered a favorite by B'z themselves. The song's lyrics center around those setting out to leave their hometowns after entering adulthood, a feeling Koshi sourced from his own experiences. When performed live on latter dates of the tour, the song was preceded by a long MC introduction by Koshi, who would come onto the stage wielding a camera to film the crowd. This feed was run onto the large screen behind the band as well. Earlier, prior to the show, staff members filmed quick vignettes of fans entering the venue and posing, which were played on the screen as well. According to the band, the recording for the song was carried out pleasantly and without much difficulty, as opposed to several others on the record. Emblematizing the theme of "light" for the album's production, "Koubou" began as a minor ballad that would bridge more uptempo songs on the work. It was not completed until the very end of the sessions and had evolved to encapsulate the entire album and its production process. The final chorus is especially emotive, more so than a normal "rust"—a Japanese musical term for the most invested, energetic moment in a song. The song was performed on every stop of the album tour but has not been performed since. The live version featured an extended guitar solo to close the song, which preceded Koshi leaving the stage early. When the band requested a list of songs fans would like to hear for B'z LIVE-GYM 2015 -EPIC NIGHT-, the song ranked in at fourth place but was ultimately not performed. In 2017, a similar list had the song ranked in at second place and it was finally revived for their 30th anniversary B'z LIVE-GYM Pleasure 2018 -HINOTORI-. Created in the final sprint of the album's production, "Traveling Men no Theme" sports an unusual construction for a B'z song and was deliberately recorded with methods matching that of The Beatles. Mixer Jay Baumgardner, who handled all songs on the album, brought to the band a book about the Beatles' recording methods and this was used as the inspiration for the song. Bassist Sean Hurley used a Hoffner bass as had Paul McCartney. Tak described it as a "fun song" akin to their previous novelty efforts like "BIG" from LOOSE and "Mou Karimakka" from The 7th Blues. Ultimately, it was only performed on the first half of the album tour and was not released on home video. In its few live appearances, Tak also took on lead vocals for a portion as can be seen briefly on B'z Official Bootleg Hidden Treasure ~Typhoon No.20~. Featuring a Latin-infused arrangement, "Ore to Omae no Atarashii Kisetsu" is one of the more unique songs on the album. The lyrical theme is reminiscient of the European art and poetry style of Mannerism. The song came early in the sessions and was recorded just after "Eien no Tsubasa". It has to date never been performed live though it was used as the ending theme to Japanese airings of The O.C. as a tie-in promotion. A soft ballad written for the 2007 film For Those We Love, "Eien no Tsubasa" was composed for a work that told the stories of the Kamikaze pilots of World War II and the families they left behind. Tak completed the opening and ending first, and only then did he move onto composing the melody. Throughout production, he rewrote the melody several times until he was content with the result. The lyrics of the song speak of the preciousness of what has assumed importance in one's life. Koshi stated that the lyrics were written about "doing something from the bottom of one's heart, for someone else. When someone does that, they grow wings on their back, and their hearts are rewarded from it. I wrote about that sort of symbolic hope." Tak recalled during an interview with NEWS ZERO: "When I went to Chiran that day, the sky was really blue—really calm. After seeing that, I really opened up to that image." That image was one that made quite an impression, causing Tak to revisit it on two future occasions. The first came in 2010, when he said he thought back to the band's visit to Chiran when he wrote a semi-sequel to "Eien no Tsubasa" titled "hotalu" for his joint album with jazz legend Larry Carlton, TAKE YOUR PICK. Later, Tak would craft an instrumental version from the original composition for his 2012 solo album Strings Of My Soul. The song has not been performed live since B'z LIVE-GYM 2008 "ACTION". Originally recorded during the sessions for 2006's studio album MONSTER, "BUDDY" was used as the Ending SE for the resulting live tour. The earlier version featured almost entirely different lyrics than the finalized version featured here as well as a slightly altered arrangement. The solo is preceded by a short interlude section that was per Koshi's suggestion. Notably, the guitar on the track was a Sadowsky which has rarely but occasionally been used by Tak live. The song has never been performed live. Complete re-recording with new vocals, new guitar, and a new arrangement; released only on ACTION. Premiered as the Ending SE for B'z LIVE-GYM 2006 "MONSTER'S GARAGE". A studio version that differed greatly would be released the following year on the 2007 studio album ACTION. The original version's lyrics were almost entirely different and featured an arrangement that was significantly different from the released edition. This page was last modified on 19 April 2019, at 05:58.